Think celebrity chef Guy Fieri eats nothing but fried chicken slathered in his famous Donkey Sauce? Well, you're not the only one. "People grab onto what they want to grab onto and you just gotta roll with it," Fieri, who opened a new chicken restaurant in Orlando, told TODAY Food. "I mean, I wore a flamed shirt for one hour 12 years ago and that thing's followed me forever!" While Fieri said it's understandable that viewers who know him best from "Diners, Drive-Ins and Dives" would think that his usual food tastes are over the top (read: big portions and lots of fried stuff), he pointed out that even on that show, his eating habits are broad. "While I do love great barbecue and a good burger, even on 'Diners, Drive-Ins and Dives,' they don't represent the majority of things I try," he said. "We feature a wide array of foods from around the world. We get down with vegetarian and vegan dishes. We hit it all. And, I'd have to say, that's a pretty fair assessment of how I eat." Fieri's daily eating habits might surprise many of his most die-hard fans. Here's what the TV star and restaurateur really eats when the cameras stop rolling. There's one food he can't live without. No, it's not Donkey Sauce or even barbecue ribs. "If I had to pick one thing that I couldn't live without, it'd probably be soy sauce," Fieri told TODAY Food. "Or Brussels sprouts." This versatile veggie is fantastic when roasted but it also makes a wonderful slaw. He also loves any type of Asian food — everything from sushi to spicy Indian curries. "That's my jam. Anywhere. Anytime." His daily diet has a surprising staple. While meat takes centerstage on many of Fieri's restaurant menus, he told TODAY Food that he definitely doesn't eat at every meal. "I'm not saying that I'm a vegetarian, but people would be surprised at the amount of plant-based foods that I eat. Don't get me wrong — I get down with a good burger, but in moderation." Fieri's family follows his lead at home. In the Fieri household, healthy eating is all about balance and moderation. The chef said that a week of meals for his family "looks a lot like most families'," packed with plenty of nutritious foods along with some treats. "We indulge from time to time but for the most part, we eat well-balanced, often very plant-based meals," Fieri told TODAY. And those versatile eating habits have rubbed off on Fieri's son, Ryder, who loves pizza but knows that he certainly can't expect it every day. 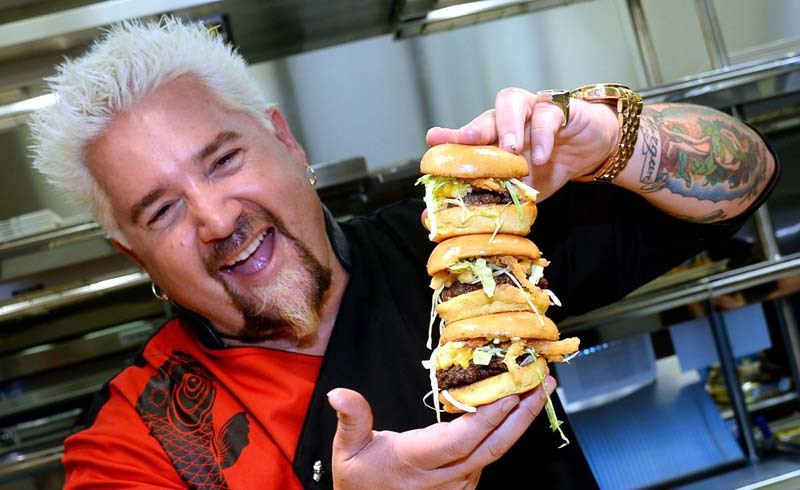 "In all seriousness," Fieri said, "he's become a great eater and is as down with sushi as he is a burger." Picky eaters at home? Try a Fieri fix. With one son off at college and another who loves to eat just about anything, Fieri doesn't have too many battles over food at home these days — but he hasn't forgotten the tricks he used back in the day to get his kids to eat well when they were younger. "People always have a tough time getting their kids to eat the right foods and, under duress, they cave and feed them junk," he said. "So, I've raised them using a few tricks to make eating both fun and, well, necessary." For starters, Fieri has always gotten his kids involved in meal prep. "I tell parents to get the kids to help, but don't give them the tedious gigs like chopping onions," he advised. "Give them something fun, like stirring the pot or, if appropriate, flipping the burgers." Getting kids involved in the process has several benefits, the chef explained: "They'll be more engaged in the meal and what they are eating." As for getting his kids to clean their plates? "Bring them to the dinner table hungry!" Fieri advised. "When I was a kid, we didn't have a house full of snacks, so when dinner came, it was on!" The TV star and restaurateur wants to debunk the idea that he only chows down on greasy diner food.